Traffic Scotland warned drivers on Thursday afternoon that the area would be shut for an hour. 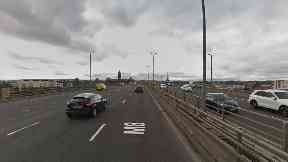 The Kingston Bridge on the M8 in Glasgow was closed due to a police incident. Police confirmed that they received a report at around 2.50pm on Thursday of a woman on the wrong side of the barriers near Anderston railway station. As emergency services attended at the scene, Traffic Scotland warned drivers that the area between J22 at Plantation and J18 at Charing Cross eastbound would be shut for at least an hour. Drivers were warned to expect delays and ScotRail advised passengers that services would not stop at Anderston railway station while the incident was ongoing. Customers were advised to use Glasgow Central low level instead. By 3.42pm, all lanes were reopened to the traffic after the incident was resolved. Eastbound drivers were warned that congestion had tailed back to J26 at Hillington. Those heading west were advised to expect slow traffic between J14 at Fruit Market and J19 at Anderston.